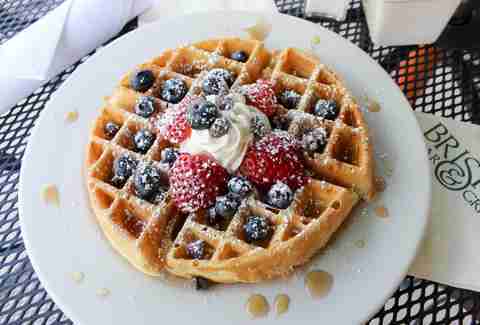 Many will hyperbolically proclaim that brunch is a way of life. And you'll look at these people and wonder if they're simply crazy or actually onto something. Let us assure you, it's the latter. 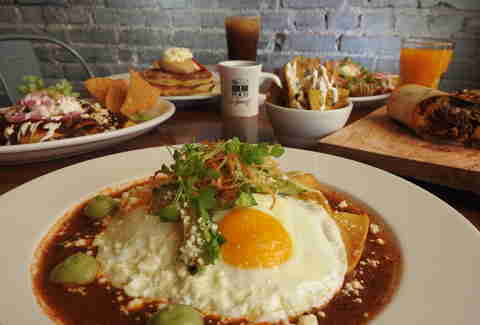 Lucky for you, Louisville is stacked with brunches, so we did the grueling research to narrow down the best spots for runny eggs Benedict, delicious Bloody Marys, and breakfast tacos. Louvino serves up a small-plate brunch with a side of jazz, and now boasts two Louisville locations. Order any brunch entree and get $10 bottomless mimosas -- you'll want to try the pancake tacos or stuffed French toast to help soak it all up. It doesn't stop there, though. 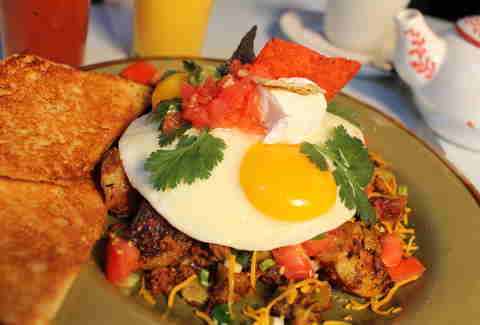 The croissant BLT pairs eggs and bacon with fried green tomatoes, and the maple eggs Benedict speaks for itself. I mean, c'mon… it's maple hollandaise. It's not even fair. Highland Morning packs 'em in tight every weekend, but an added St. Matthews location should help ease your wait for one of the most rewarding brunches in town. 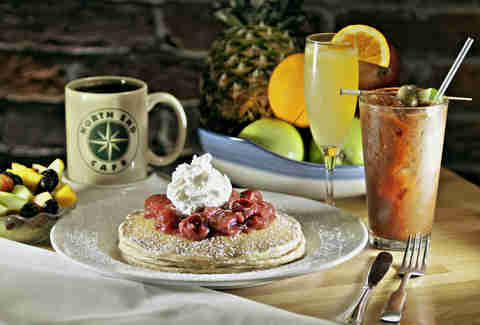 Regardless, whether you're ordering the famous Baja Benedict (a much-needed update on traditional eggs Benedict with chorizo), the Good Morning breakfast burrito (packed with three eggs, sirloin steak, bell peppers, and more), the classic breakfast (two eggs, meat, and a biscuit), or one of their specialty pancakes, it's well worth the wait. Skip breakfast and hit Bristol, where it serves up a "bountiful" (its word) buffet-style brunch, featuring Southern favorites like Belgian waffles, Weisenberger cheese grits, fresh fruits and vegetables, fried chicken, biscuits and gravy, and lots more, including seasonal items. Wash it all down with a $2 Bloody Mary. And, hey, you can't go wrong with unlimited bacon. Tucked away behind Holy Grale, Gralehaus serves up one of the most non-traditional brunches in town with biscuits & duck gravy, lamb sausage & grits, or crispy pork hash. 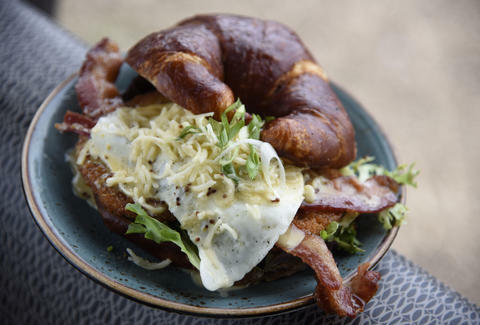 The egg sandwiches (pretzel croissant, anyone?) are particularly popular, topped with options like avocado, pepper jelly, and scallion kimchi. It also has a pimento cheese and pickle biscuit which tastes a whole lot better than it sounds. Start your morning off with a breakfast shandy (the workin' man's mimosa) or a spicy Bloody Mary before easing into poached eggs & country ham with Weisenberger grits. Hell, this place will even put ham IN your Bloody Mary. Did we mention it has ham? You'll know you're in the right place when you see the head-on collision out front. Harvest's farm-to-table brunch includes signatures like Louismill Grits-N-Goo, Ivor's Black-Eyed Pea Hummus Sandwich, and Southern-fried bologna. Or keep it simple with a Big Ol' Biscuit & Gravy and/or the burgoo, a Kentucky dinner staple (stew made with rotating meats and vegetables) which is so good at Harvest, you can get it for brunch. 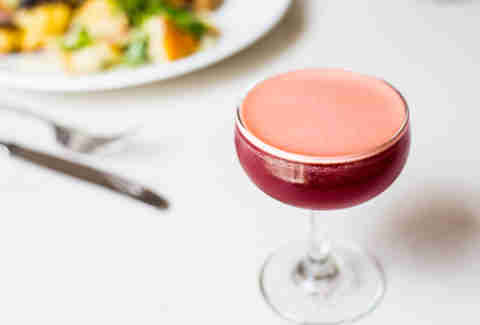 A Louisville brunch mainstay, Toast serves up a bulging menu of lip-smacking items ranging from lemon soufflé pancakes to an Atlantic omelet with smoked salmon and cream cheese. And you can't go wrong with the Monte Cristo, featuring two slices of brioche filled with ham, baby Swiss cheese, and a touch of orange marmalade. Essentially everything here is fried to a crispy goodness, and that's a good thing. 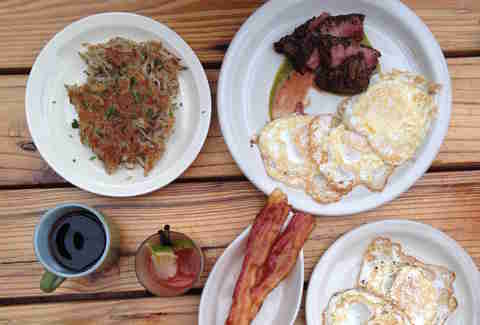 Even the traditional steak and eggs gets a little update with the house-made salsa verde, and the Bloody Marys are next-level spicy. A staple on Frankfort Ave for years, North End has a steady flow of people in and out its doors. It serves breakfast all day long, and because of that, you can have brunch whenever you want. The French toast is a favorite, but you can stretch your limits with house-smoked trout hash, $3 breakfast tacos, or the meat omelet, with meat selections of the day. You won't go home hungry. Proof on Main has become a name synonymous with the best in Louisville dining, and its brunch doesn't disappoint. Although this may not be the place to revive your hungover self the morning after, it is perfect for brunch with the family or a date. Go for the French toast casserole or the signature Proof Benedict, made with a country biscuit, country ham, and red-eye hollandaise. And if you dive into the spicy eggs in purgatory, you may never want to come home. From breakfast burritos to the Mr. Potato Head Casserole, the menu at Wild Eggs will take you a minute -- or 15 -- to look over, but trust us when we say that anything you pick, you'll be more than happy with. If you want to keep it simple, you can simply order some granola or oatmeal. But if you are daring enough to try the Mr. Potato Head, you'll be awash in hash brown potatoes baked with sour cream, diced onions, Cheddar-Jack cheese, eggs, sausage, diced tomatoes, poblano peppers, roasted mushrooms, queso, and… yeah, that about covers it. Trust us when we say that the drive to Village Anchor is worth it. You'll be thanking us once you take the first bite of its red velvet pancakes, or partake in its $1 mimosas. From omelets to chilaquiles, this place is brimming with eggs and more eggs, but be sure to order the ones with the signature chipotle gravy. Of course, there's always the breakfast torta with Oaxaca cheese, arugula, tomato, avocado, cilantro aioli, and your choice of ham, bacon, or chorizo. Oh yeah, and eggs. 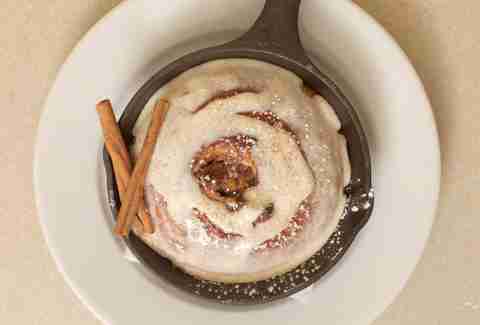 If you have a sweet tooth when it comes to brunch, you need to check out SuperChefs. From candied bacon and waffle donuts to "Super Cakes" like Reese's Cup pancakes, you'll be riding a sugar high until dinner. If you want to feel like royalty, dig into the Elvis: Waffles are layered with peanut butter and bananas, then topped off with chocolate and caramel syrups and bacon. Lydia's a noodle joint by night, brunch spot by day, that brings everything from corned beef hash and tofu scrambles to the table. Try the cinnamon griddled bread pudding for a sugar high, and if you're looking for something extra hearty, order the signature Hot Mess -- a pile of ham, onions, Cheddar, and Blackstone gravy with two eggs and potatoes. 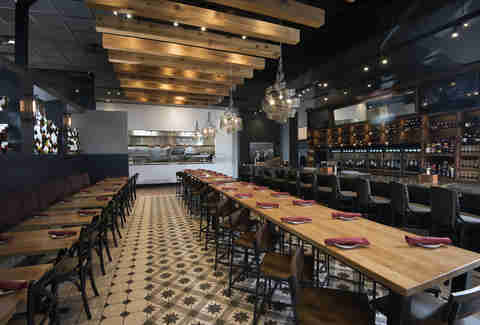 Tucked in an out-of-the-way Downtown location, this place has quietly been a mainstay for years. From homemade baked goods (try the sour cream blueberry muffin) to huevos rancheros the size of a small town and specialties like the ham-laced Stephen Foster, it's hard to go wrong. The quaint decor and spacious deck provide the finishing touches. Out in Norton Commons sits Verbena Cafe, a brunch spot worth the drive. 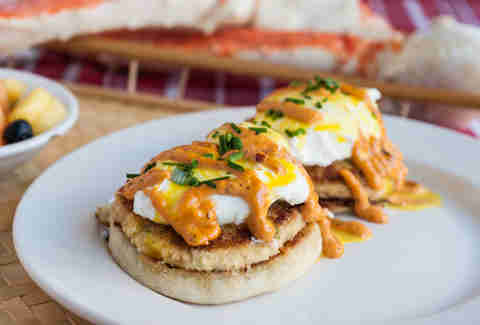 Eggs Benedict and Florentine? Covered. Skillet dishes? Check. 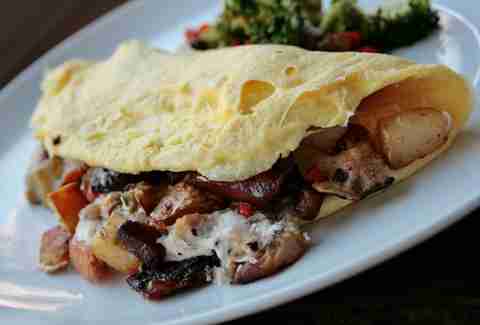 Or just sit back and enjoy the Verbena omelet, made with sautéed asparagus, shallots, turkey sausage, and smoked Gouda. What's more, the presentation and atmosphere bring it all home for a brunch experience worth repeating. Josh Johnson is a writer in Louisville. Kevin Gibson is a Louisville-based author who writes about everything from food to beer to the great city he calls home. He has won numerous awards for his work, but doesn’t know where most of them are now. He also loves his dog.